The difference between hard and soft styles :-) Courtesy of Commissioned Comic. When teaching beginners to move in Tai chi, one of the first exercises to do is tai chi walking. This is where each step is taken by first place the foot and then transferring the weight, so that any time you can stop or reverse the action. This is different to normal walking which is called "controlled falling". This controlled falling type of motion is perfectly embodied by this new robotic walker, that can walk for up to 13 hours without any motors or active control! The energy efficiency of controlled falling is exactly why we normally use it in daily life. 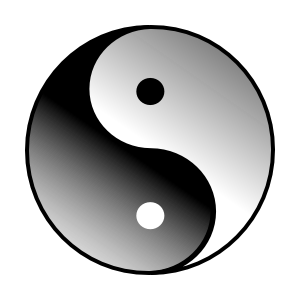 However in tai chi terms, what you sacrifice is stability i.e. it would be very easy to trip this robot up. Robots are therefore evolving from a more stable "tai chi" like way of moving, into a more dynamically unstable "normal" way of moving. Ironic then that as humans we're trying to move the other way. 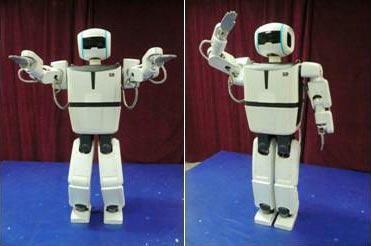 Could it be that robots are just naturally better at tai chi*? For over a decade I struggled with chi. I wanted to believe it existed, but I knew scientifically that it could not. This dilemma vexed me, as I believe it currently vexes an extremely large number of scientifically minded (i.e. most Westerners) internal art practitioners worldwide. Perhaps ignorance is bliss, so if you believe in chi I say good luck to you, but just like religion, you can not make someone believe through rational argument. What really opens the door to this way of thinking is the appreciation that consciousness, intelligence and mind are but the tip of the iceberg (just as neuroscience teaches us). The human body is made up of billions of neurons and nerves, each one of which is effectively a tiny sensor acting on the environment around us and also inside us. 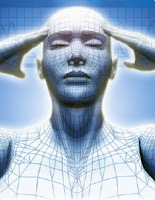 As we go up the consciousness hierarchy these sensors are grouped together into things we ordinarily call sensations, feelings, emotions, instincts, intuition and awareness. It is impossible to be able to process every neuron at the conscious level, we have to accept the emergent nature of ourselves and try to listen to our body, our feelings and our emotions. The philosophy of Enlightenment if you will (swapping my Westerner dictionary for my Eastern one for a moment). That bottom-up way of thinking is complemented by the top down view. How does one command the body? Just as we cannot perceive an individual neuron, neither can we consciously command it. The body does not understand logic, language or conceptualisation. We can not talk to the body using syntax and grammar. We talk to the body using visualisation and feelings. If you imagine yourself performing an action, you will get better performing it. If you imagine yourself being happy, you will become happier. 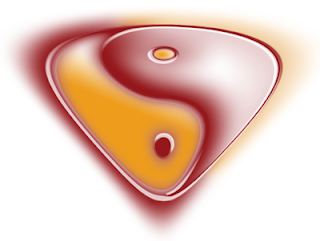 This visualisation and concentration is a core part of traditional meditation and tai chi teaching and in the latter is called yi/shen (translated as "mind intent"). Chi is not energy, but do not despair traditional reader, I am not dismissing it out of hand like some arrogant philistine. Chi is an incredibly sophisticated visualisation framework (in the top down sense). It also does indeed feel like there is an "energy" inside you if you truly listen to your body and practice hard (bottom up sense). The crucial distinction is that there is a difference between what something feels like, and what is actually there. In scientific terms, chi is not energy, but in practical terms if you actually start paying attention to your body it feels as if it is. Q: Can I devise a scientific experiment to measure “love energy” directly? Q: Is love a way of describing an internal subjective sensation using a common language to exchange ideas and thoughts about feelings and emotions? Q: Does love actually exist? Q: Do I feel like it does, so it doesn’t matter anyway? So there it is, when you deal with other people, the better the interaction is, the more love you feel. Perhaps a better word for love is the Buddhist concept of metta (i.e. 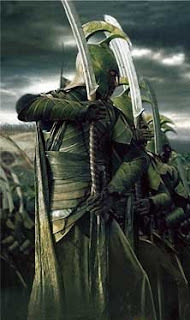 loving kindness), along with it's allegory, hate. The better your interaction is with yourself, the more chi you feel, and of course it's allegory is pain. Chi is not energy - it is an emotion, a feeling, a sensation - a realisation that rather than invalidating it, emancipates it. After all emotions may not exist in a pure physical sense, but they certainly have real world effects. Love is about society and relationships. Chi is about internal physiology and well-being. Love and chi are in a sense the same thing but in different contexts. It cannot be a coincidence that they both originate in the gut. This picture represents a 2D model of Tai Chi, and chi. What we have is a little robot (as an approximation to a human) standing on the ground and pushing against a spring. This robot has four different joints connected together by linkages, and the question is how much force can this little robot issue into the spring? We also assume that this that there is infinite friction between the robot's "foot" and the ground, to remove any complications to do with grip (or rooting). 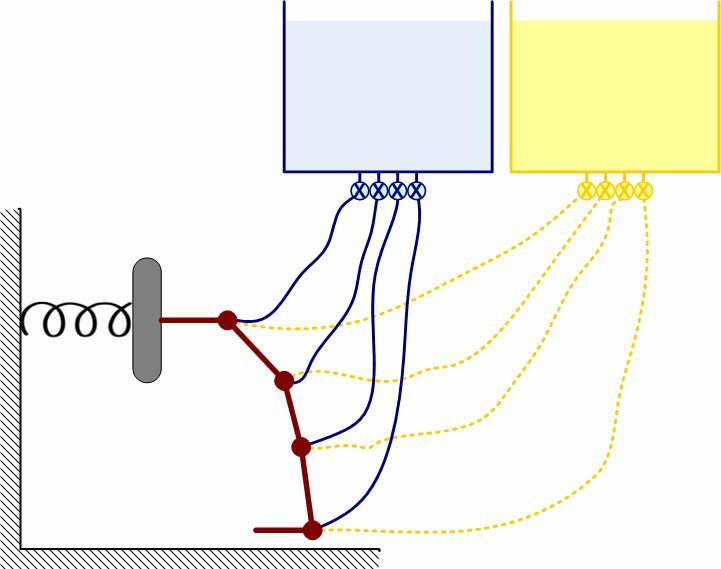 In this diagram I also represents the concept of total (scientific) energy available, as the big bucket filled with water. Humans have only a finite amount of chemical energy available to them that they can transform into muscular force. This is the classical scientific view of energy, which can transform stored chemical energy (glucose) into a force on the spring (pressure). 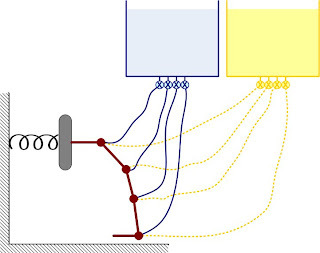 To model this transformation, connected to this bucket are a series of hosepipes and taps that go to each of the joints, so that the joints of the robot are controlled by hydraulics. The question now is how do I distribute the total amount of hydraulic pressure available across the different joints in order to achieve the maximum force into the spring? This can be solved mathematically (which I leave as an exercise for the reader :-). Intuitively however it is likely that the optimal structure is, an arrangement whereby the linkages of the robot form a classic arch, just as has been used for thousands of years in civil engineering. To my mind therefore doing Tai Chi is akin to solving this problem. If we can distribute our available glucose energy throughout the joints of the body optimally, that will be the maximum force we can issue. 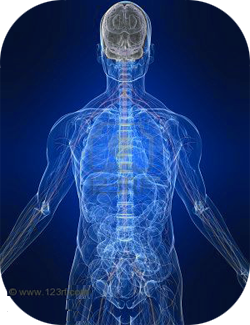 How much chi we have therefore is equivalent to how optimally we transfer force across the joints of the body. This is commonly referred to as maintaining "your structure", "correct body alignment" and "whole body coordination". The better we are at utilising every possible joint and muscle, the more effective we will be at issuing force. Chi is therefore a measure of how efficient and effective we are at solving this complex optimisation problem instinctively. No one actually solves a complex optimisation problem mathematically in real-time of course, what we do is use the feelings and sensations from within our own body to "just do it". In Chinese parlance we call these sensations "feeling that chi". I do believe that the concept of "chi" is useful. It is a powerful way to visualise how things feel inside the body. All we have are feelings and it is perfectly valid to feel as if chi is flowing, even if it doesn't exist. After all, we are happy to visualise things like "extending our roots into the ground like a tree", but no one in their right mind would claim that we actually have roots, and understand it is just a metaphor. Chi is an incredibly powerful visualisation metaphor, and mastering these feelings of chi is fundamental to achieving mastery of the internal arts. It is of course important to realise that there is a distinction between how things feel and how things are. Chi is not energy it is a feeling. What is chi? This is a fundamental question of the internal arts. To my mind is it also the root cause of why Westerners are sceptical of practices such as yoga and tai chi. Internal arts teachers rabbit (or should that be parrot) on about chi being energy (as they were instructed), but chi is not energy and I will explain why. 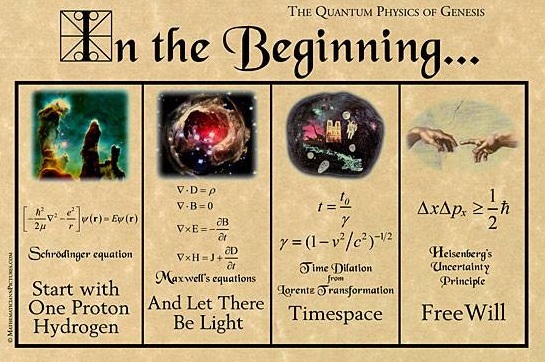 Energy, in scientific parlance, is a specific property of the universe that can never be created or destroyed, only converted from one form to another. 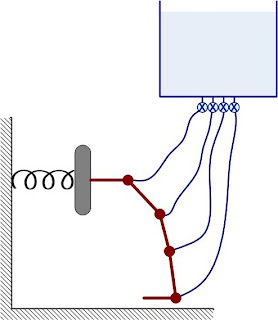 This conservation of energy law is fundamental to all science and cannot be credibly disputed. Energy can be stored in many forms, from electricity, to heat, to momentum and so on. For example, electromagnetic energy (sunlight), can be converted to chemical energy by plants, plants can be processed to create oil ("bio-diesel"), which could then be converted by an engine into kinetic energy (motion), and so on and so on - an endless chain of energy conversion. The question is can I change any form of scientific energy into chi, and back again? Can I put chi into an energy chain as I have just done in that example? I believe the answer to this is no, and therefore chi is not energy. Until someone can devise an experiment which proves otherwise, and thousands of people have tried to do so for decades without success, that will remain my position. However, it's easy to be negative and disagree with something, it is of course more difficult to be constructive, and so here is my explanation for what chi is. Although energy can always be converted from one form to another, in practice what happens is that when it is converted, it changes not into another single form, but into many different forms simultaneously. So for example when I convert electricity to light in a lightbulb, I also generate heat. As a whole the energy of the system is still conserved, but I have only managed to convert (say) 50% of my electrical energy into light energy, which is really what I'm trying to achieve. This percentage is normally called the efficiency (of the lightbulb). If a new form of lightbulb comes along that allows me to convert 80% of my electrical energy into light energy, that new bulb is more efficient than the first one. Chi is better thought of as being an analogy to this efficiency, rather than the energy itself. 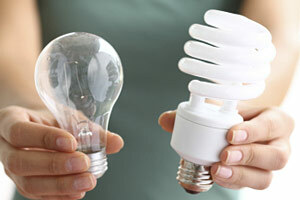 These new lightbulbs will give off more (light) energy for the same amount of electrical energy input, but it does not inherently have more energy itself, it is just more efficient. This is excatly what chi is, a property of the system, not a physical quantity. So if you "cultivate chi", you do not have more energy, you just become more efficient at using the energy you do have, and so you appear (even to yourself) more energetic. So to express this in more internal arts like terms, imagine trying to block/deflect a punch. 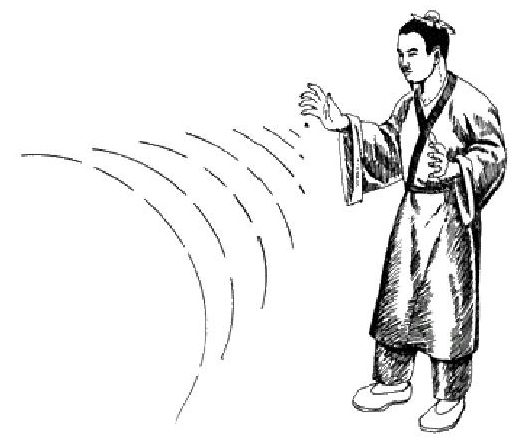 If a Tai Chi Master does this ("who has cultivated a lot of chi"), they will be able to block the punch with minimal effort. They can do it with minimal effort, and hence use only a tiny amount of energy, because the master is extremely efficient at coordinating his body. However, if the novice tries to block the punch, he will find it much more difficult and will use a lot of energy to defend himself. The novice is not very efficient at using his body, or to phrase it another way he lacks chi. The significance of what I'm saying is that in practical terms nothing changes. In our classes we can still "cultivate chi" (or "enhance efficiency"), and train in the same way we've been doing for centuries. Internally within our own bodies it feels as if we do have more energy (just as our new lightbulb will shine more brightly) and so we get that glow and feeling of health. However by reinterpreting chi as efficiency rather than energy, the concept of chi is no longer at odds with Western science. There is no longer any discrepancy between Western science and Chinese medicine. The major obstacle of scepticism has been removed. To see this in practise consider that tai chi is about coordinating the body in an efficient manner. The more efficient you are, the more you will be able to perform with your current level of strength. Or alternatively, you will be able to do everything you do now, but without using so much energy. Of course it is not just about muscle strength, but also about the way the internal organs work together and the whole array of complex interactions, all of which can of course be made more efficient. As you train more and more, the tai chi principles will start to become subconscious and will carry through to your daily life. You will feel full of beans, less tired and all those other great things that tai chi brings, not because you have "increased your chi energy", but because you have increased your efficiency and are able to do more with less. Fundamental to tai chi training is relaxing the body, another principle that is easy to relate to the efficiency interpretation of chi. In order to move around we use muscle strength. Muscles work in pairs, for example you tense your bicep (and relax your tricep) to bend your elbow, and you tense your tricep (and relax your bicep) to straighten it again. Your bicep and tricep operate as a pair (in simple terms). It is however difficult to fully relax muscles. If I could totally turn off my tricep (i.e use 0% of its strength), I would only need a tiny amount of my bicep strength to bend my elbow (i.e. 1% of its strength). That would be very efficient indeed and achieved through relaxation. If however I cannot fully turn off my tricep and it uses 5% of its strength say, in order to be able to bend my elbow I have to overcome the strength and use 6% of my bicep strength. I have wasted a lot of energy to achieve the same effect. The more I am able to relax my body therefore, the more efficiently I can operate and the more I can "feel the chi". I fully believe that chi is all about the sensations within your own body. It is like the opposite sensation to pain. If I feel pain it means something is going wrong. If I feel chi it means something is going right, it means my body is working at peak efficiency. Those of us to work with computers know that software is slow and hardware is fast. If you want your program to run quickly you have to implement it in hardware. Of course the downside from the engineering perspective is that it costs an awful lot more money and time to create a purpose-built dedicated hardware platform, than to code a piece of software to do the same thing on a standard PC. I see this as a perfect analogy for internal arts. If you want to do something consciously (software) it is slow and awkward but it can be done. However if you can do something subconsciously (hardware) it can be exceptionally fast, natural and effortless. And similarly to the computer, training yourself to do something consciously is relatively easy, but training yourself to be able to do something subconsciously requires a great deal of time, dedication and practice. ME: "...I certainly agree that there is much that is unexplained in this world. 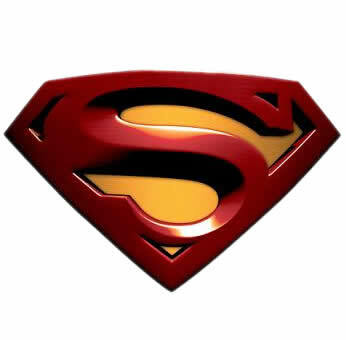 If you could point me towards some physical phenomena that are unexplainable, I would be most interested!" Whether or not this video was sent as a joke in this particular instance, I don't know, but either way I have encountered numerous people who consider things such as this "evidence". This is most certainly NOT evidence or conventionally unexplainable, and I will explain why below. In my opinion, in the wider perspective, people quoting things like this as evidence gives the internal arts a bad name. If you quote things as fact that are not fact, it has the opposite effect and actually alienates people who are technically or scientifically minded like myself. This video squarely falls into my "hippie babel" category. Ok, so let's get specific. What's wrong with this video? First of all, this is a TV show. 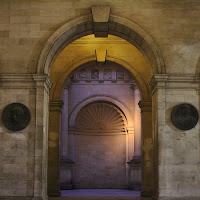 It's whole raison d'être is to provide sensationalism and to dress up the mundane as exciting. As a TV show it has absolutely no requirement to tell the truth or to adhere to facts. Moreover, TV is based upon lying and manipulation with things such as trick photography and re-editing footage commonplace. Simply, you cannot believe anything they say. Next 200 degrees Fahrenheit (93 Celsius) isn't actually that hot. I would speculate that it is possible to generate such heats with friction alone without invoking "chi". Indeed, we see in the video the chi gung master rubbing his hands firmly together frequently. Increasing pressure also generates heat, and again we see the master squeezing the towel repeatedly. If you look at the heat pattern from the IR camera, it is clear that the hottest part of his hands are where he has been holding the towel. Could it be that it is the towel that is in fact hot? Where does this towel come from? Who knows, just off camera he could have a big bowl of hot water that he keeps dipping it in? They have testimonials in here from doctors. So what? Testimonials are not evidence. Heat therapy and gentle massage of the body to alleviate (not cure mind you) arthritis pain? What's unconventional about that? What would be more compelling to me (but remember my TV caveat), would be a continuous shot of his hands through the IR camera. Why not show his stationary hands in plain view (not doing any therapy) starting at normal body temperature and rising (to 200 degrees) as he directs his energy? That would be more convincing about his ability to control his energy. The walking on paper bit is a complete non-sequitur and not even nearly unexplainable. This has been performed for thousands of years, in its more standard guise of "the bed of nails". I think I'll stop there. For this to count as evidence, it must be beyond reasonable doubt, and without alternative explanations. The point I'm trying to make in the above statements is that this video contains only doubt and so there are a huge number of alternative explanations. Hence, it can not be considered as evidence or even in anyway convincing. All this is not to say that I don't believe that this guy is a great chi gung master, I'm sure he is. Moreover, I'm sure his therapies do work. What I'm criticising here is the fact that this is "conventionally unexplainable", it is not. What we need to be able to reliably quote something as evidence is either peer reviewed publications or double-blind trials. Hearsay and testimonials are just marketing and PR. I'm sure this master has genuinely helped many people, and I myself would probably go to him if I had the opportunity and need. The point is, there is a difference between belief and science. Belief is easy, science is difficult. People who claim there is science or evidence need to be careful, because it is a double-edged sword. If you can provide evidence and scientific research there is no more powerful argument, however, if it turns out not to be true, not only do you undermine your particular argument but you damage your entire reputation and credibility. 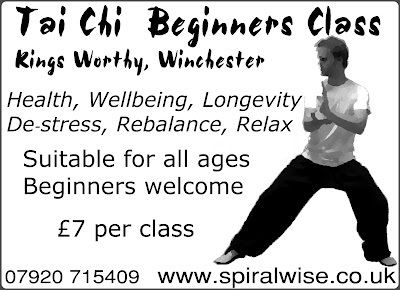 The new round of beginners classes starts in Winchester on Wednesday 5th October, with a free taster session. Posture affects your mood, and your mood affects your posture. Or to put it another way your body affects your mind and your mind affects your body. As I talked about before, this feedback relationship is fundamental to tai chi, and now I can point out some decent research to back that up (and another write up here). "Subjects in the high-power group were manipulated into two expansive poses for one minute each: first, the classic feet on desk, hands behind head; then, standing and leaning on one's hands over a desk. Those in the low-power group were posed for the time period in two restrictive poses: sitting in a chair with arms held close and hands folded, and standing with arms and legs crossed tightly. Saliva samples taken before and after the posing measured testosterone and cortisol levels. To evaluate risk tolerance, participants were given $2 and told they could roll a die for even odds of winning $4. Finally, participants were asked to indicate how 'powerful"' and 'in charge' they felt on a scale from one to four." As this much more detailed article underlines, the implications are simply that if you want to affect your mood, it is sufficient to change your posture. Or simply "fake it until you make it". So to extrapolate into tai chi terms, if you relax your body your mind will follow. "The majority of studies on Tai Chi conducted between 1996 and 2004 had focused on health and well-being of Tai Chi exercise for senior adults. The results showed that Tai Chi may lead to improved balance, reduced fear of falling, increased strength, increased functional mobility, greater flexibility, and increased psychological well-being, sleep enhancement for sleep disturbed elderly individuals, and increased cardio functioning. Wang, Collet and Lau did a systematic review of Tai Chi research and found some limitations or biases in existing in some of the studies and it was difficult to draw firm conclusions about the benefits reported. Therefore, more well-designed studies are needed in the future. They need to be studies on the effects on younger and middle-aged people. More longitudinal studies are needed, since time is an important factor of physical and psychological interventions. Studies on the effect of Tai Chi on the immune system and bone loss reduction are still very exploratory and will be especially useful for arthritis patients and others with immune disorders. Future studies should investigate outcomes associated with Tai Chi training as a function of different instructional techniques, different Tai Chi styles, different diagnostic groups and different age groups. It is not yet clear which of the components in Tai Chi makes the exercise form especially effective for seniors. Tai Chi exercise is a relatively "low tech" approach to preventing disability and maintaining physical performance in older adults. The positive effects of Tai Chi may be due solely to its relaxing, meditative aspects. The current data suggest that Tai Chi can influence all the individuals' functioning and well-being and provide some appreciation for why this exercise for has been practised by older Chinese for more than three centuries." To my mind this confirms my feeling that although there are clearly benefits and widespread anecdotal understanding of the therapeutic benefits of Tai Chi, this is a long way from being scientifically accepted. This is not to say that I don't think there are benefits, but the crucial thing is that scientifically speaking, these benefits need to be demonstrated relative to a control group. The point I'm trying to make, is that of course there are benefits of doing Tai Chi - exercise is good and relaxation is good, no argument there. But relatively, is doing Tai Chi better than going for a regular daily relaxing walk of a similar duration, or sitting quietly watching the ducks say? The answer to that is very far from clear. Star wars... Tai Chi.... and Psy Trance. It doesn't get better than this! What were your New Year's Resolutions? No doubt their goal was to improve your life in some way, to make you happier. We all want to be happy, not just occasionally, but fundamentally. Trouble is, that's where it normally stops, remaining a hope, a wish, a desire. So how do you become happy? Everyone knows the answer already; it's common sense. Any self help book boils down to this paradigm. It is not only the strategy to make you happier, but to improve your sporting prowess, to improve your exam results, even the way to drink more beers without falling over. So what is it? One word: Practise. But how do you practise to be happy? Well start now - just try to be happy! As a beginner though, you will need to start slowly. Try setting aside five minutes each day to practise being happy. Within those five minutes, think positive thoughts, laugh, smile and appreciate all your good qualities. Watching TV doesn't count mind, you need to concentrate without distractions and without a fear of being judged. It's free, safe, requires no special equipment, and you can practise anywhere. Sounds easy huh? Unfortunately most people are simply not dedicated enough to do it. Maybe once, twice, maybe a whole week, but then it lapses. The result is also subtle, indirect and cumulative; there is no high and no adrenalin. The effects creep up on you. It might take six months, before someone comments on how happy you seem. That moment though will be magical. "I am happier" you will think, "It really does work!" Anyone can teach themselves, but everyone learns faster with a teacher, and perseverance is easier in a group. Classes and teachers of happiness are everywhere, but traditionally go by a different name. So if you want to be happy, put aside the fear of the unknown, and join a Meditation class. Today I discovered the wonderful Google Labs Ngram. This new tool allows you to graph the number of counts of particular keywords in all the books Google has scanned, grouped by the date they were published. What this means is that you can effectively track how much people were writing about particular topics over time, or how phrases come and go from the English language (and others) for example. So I had a go at using it to back up some of my assumptions about tai chi in a quantitative manner. First of all, spelling: Tai chi, Tai ji or Tai qi? [No one seems to disagree about the Tai bit]. The graph above shows the incidence of the three main spellings (Tai chi, Tai ji and Tai qi), along with various contractions and extensions, in the published books going back to the 1950s. What this shows is that prior to the 1960s it was spelt almost exclusively without space with both Taichi and Taiji being roughly equally prevalent. Around the 1970s Tai chi (with a space) started to enter lexicon and this continued up until the late 1980s with roughly half of the publications using Taiji, and the other half used Taichi or Tai chi. For some reason in the early 1990s there was an explosion of interest (see below) and Taichi and Tai chi became the dominant form of expression. The incidence of Taiji spelling therefore fell (as a percentage of total usage). The most recent 2008 data indicate that Tai chi (with or without a space) is now the most normal spelling in about 85% of the cases. As the English language (and spelling) is a fluid concept that continually evolves as usage patterns change, we must therefore say that Tai chi is the "correct" form of spelling. I predict therefore that over the next 50 years time the Taiji usages will drop away, to be consigned to history. 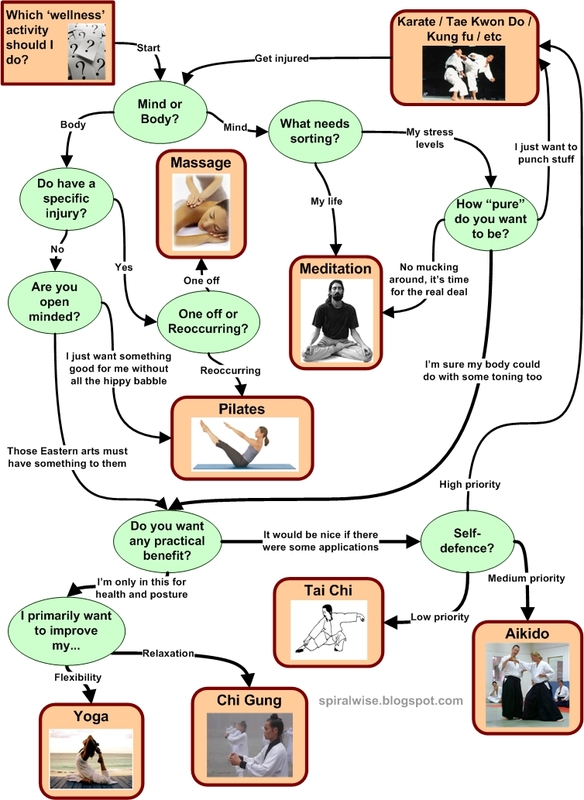 This graph clearly backs up my experiences of explaining tai chi to people. It's easiest to say "it's a bit like yoga" to get them into the right frame of reference, and then "it's a martial art" which also helps them narrow it down. What's interesting from this graph however is that yoga has been written about for a much longer time in western books than I imagined. Most likely this is because of the colonisation of India by the British exposed Westerners to it. There has clearly been a surge in popularity of Chinese martial arts and Tai chi in the last couple of decades however, which again backs up my own experiences. Pretty much a no-brainer this one. Yang style dominates with the other styles not making so much as a blip. 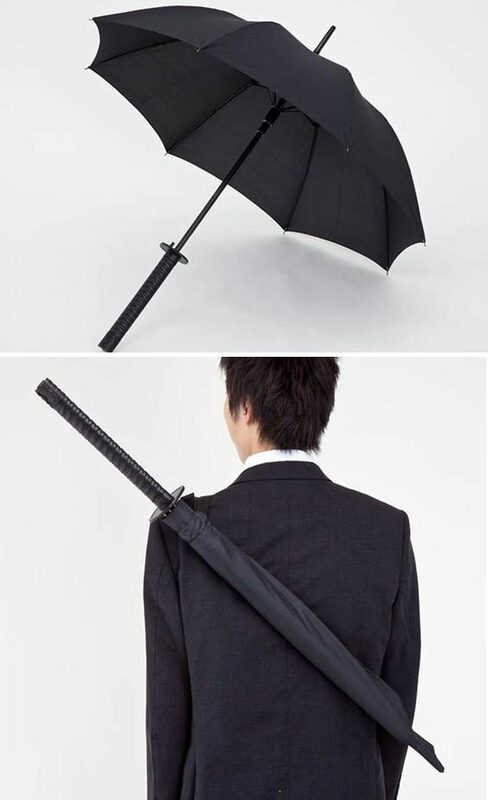 What fantastic marketing by the Yang style guys. Most likely however this is due to the fact that some of the Yang style teachers were the first to takes the brave step of trying to teach their art in the West, for which no amount of credit and gratitude can be too much. Given this graph however, it is little wonder that most Westerners don't realise there are multiple styles and just believe that Tai chi is Yang style. Those of us practising other styles need to work that little bit harder! I often get asked by beginners things such as "how long does it take to learn the form?" and "are we going to be learning lots of new movements?". And indeed, I used to ask such questions when I first started, as it is natural to want to feel a sense of progress and gauge your development. However, after a few years, you realise that even people who've been practising their whole lives are still doing the same foundation exercises that the beginners are doing. What this means, is that Tai chi is essentially about quality not quantity. Refining a small number of movements to perfection rather than developing a huge repertoire at a substandard level is the name of the game. The problem is however that such a statement doesn't really sound appealing to beginners. Mainly because new learners have no appreciation of the depth and subtlety but also because it is not quantifiable. How many moves you know is quantitative - a number you can see increasing, how good your movement is is a feeling and therefore qualitative. It's difficult to gauge progress in a qualitative way when you are new to the experience (and even when you're not!). Qualitative quality - not quantitative quantity! I previously mentioned the 3D computer program to teach you Tai Chi. I was a bit disparaging about it, but I see that it is possible to learn Tai Chi using Microsoft Kinect system and the Your Shape Fitness Evolved 2012 game. The graphics are far more sophisticated than the game from the previous post, and you can see quite a lot of subtly from the instructor. It seems to me that this would have the potential to actually be a reasonable learning system as it is interactive. The closer you are to the correct posture the more points you are awarded. 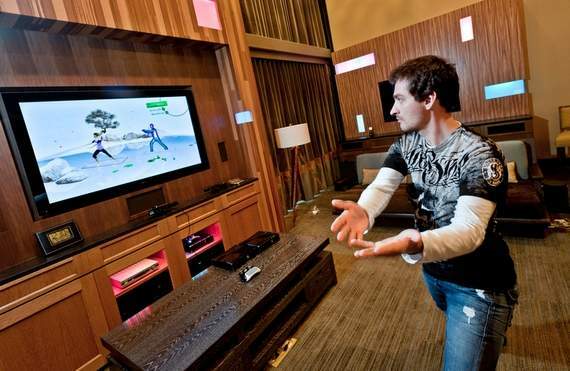 How fine-grained it is possible to determine your subtle posture to using the Kinect system is another question, but in principle this seems to me to be a very good idea. I can hardly find any information about it on the Internet, so if anyone knows of anything or has any experience with it, please add some comments to point me in the right direction. I did find this video which gives you an impression of how it works. Essentially it is a couple of Russian guys mucking around, but if you can ignore them, you can start to see the system in action. So what do we think of this then? 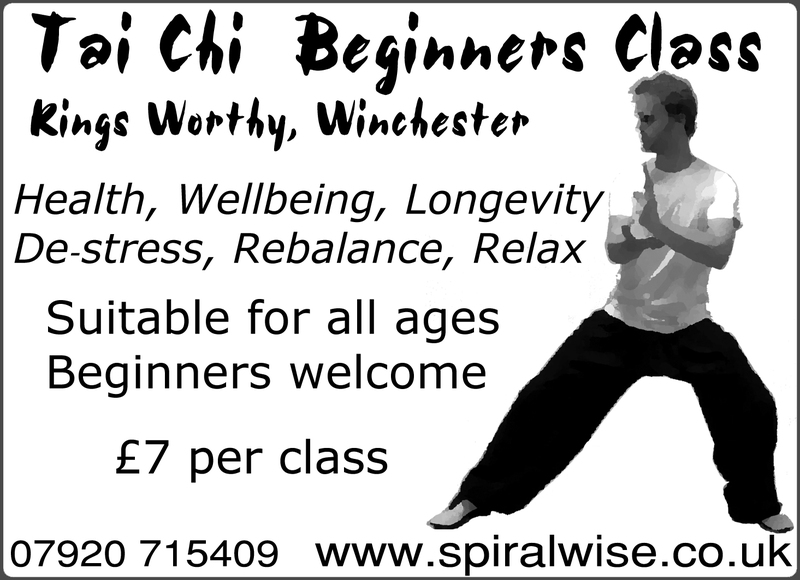 I never thought that learning Tai Chi from a DVD or video was a good idea, but nevertheless a lot of people do and it seems the format is evolving. 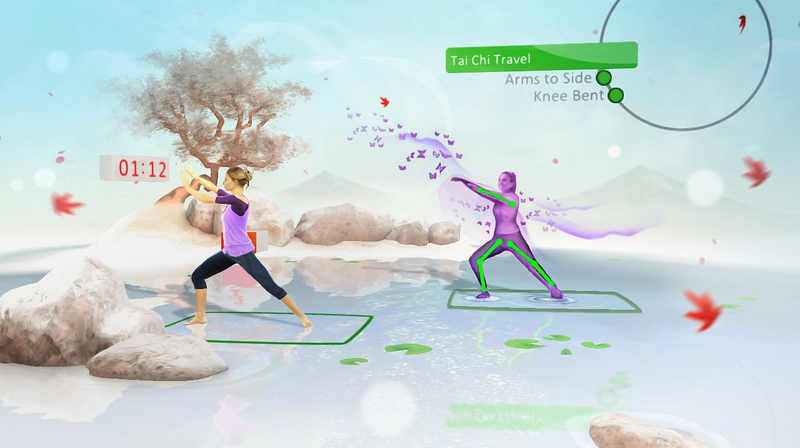 Witness the first 3-D computer program to teaching tai chi. Although you have "no limitations of viewpoint" the blocky gaming avatar graphics mean that all the subtleties are lost. Good innovation but I wouldn't recommend it. Tai chi is traditionally a formal and prescriptive practice. However, there are lots of scientific insights that can be gained from other disciplines and sports science and incorporated into training regimes for improved performance. Just because "that is the way it has always been done" does not mean that the best way, and as good scientists it is our duty to investigate them. 1) Swiss ball. As I have a computer-based job in the real world, I obviously spent a lot of time sitting in front of it. Sitting immobilises your spine and causes all of your balance reflexes to become dulled over time. By sitting on a Swiss ball you engage in "active sitting" that maintains your balance skills continually strengthens your back. 2) Poi. Poi is basically a performance art similar to juggling. 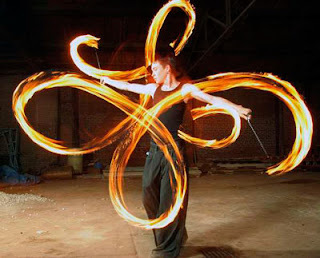 The movements require you to continuously spin pendulums around your body, which with practice can form hypnotising patterns (experts even set them alight for fire-poi dispalys). However from an exercise perspective, I'm not sure there's anything better for toning your arms and shoulders. As you have to continually keep the ball end of the poi spinning, there is a centrifugal force that you must counteract with your arms. As the spin direction of this force changes you must therefore exert this force in a continually changing direction, which work the muscles for dynamic strengthening in all directions. Anyone who practices Tai chi will recognise this need to project force outwards in all directions is a fundamental tenet of tai chi. Not only is poi strengthening, but the diverse rotation planes mean that your shoulder and arm joints become significantly looser and more flexible. I really do recommend poi to anyone who would like to loosen their shoulders, elbows or wrists. 3) Contact juggling. I do not do this myself, but it's my intention to learn. Lots of Tai Chi is about visualising a ball and controlling it. Indeed I understand there are a whole sets of Tai Chi exercises and forms that use a ball. You just have to watch a contact juggling video to see the obvious parallels. 4) Core Balance Discs . These inflatable discs are slightly oval in shape and therefore to stand on them requires quite a lot of balancing skill as it makes you very unstable. I have two of them, and by putting one under each foot and then performing chi gung or silk reeling exercises, it really takes the difficulty to a new level. 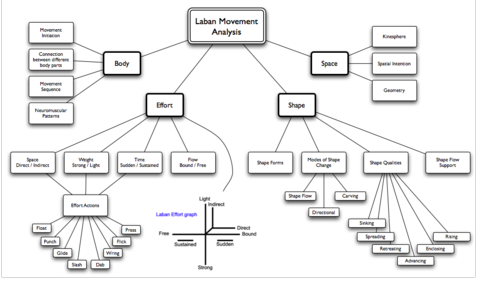 It's amazing how much your understanding of the movements improve (by identifying where you are unbalanced or weakest) as you wobble around all over the place. Best practice privately, at least to begin with, as graceful it is not. I heard it said over the weekend that charging and discharging your dan-tien was similar to charging a battery. That analogy was flawed, as it is in fact the exact opposite. With a battery the more you repeat charging and discharging cycles, the weaker it becomes and it starts to lose its ability to hold charge. Where as with Taichi (and indeed most exercise) the opposite is true - the more cycles of training and rest you put your body through, the stronger you become. In other words the more you train (which is exhausting/discharging), the more you increase your body's ability to hold charge (or chi if you will).